Once again the US Open provided a great weekend of Slalom and Wildwater racing with the slalom events serving as a regional qualifier for the US National Team. Many of our Wildwater athletes qualified for the Slalom finals on Sunday with recent competitors in the Wildwater Team Trials Pablo McAndless and Jamie Tidmore taking the 1st place finishes in slalom K-1M and slalom K-1W. Wildwater participation was limited this year due to many of our athletes qualifying for slalom finals and the race occurring on Easter Sunday. 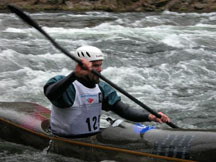 This year the Wildwater race consisted of a classic event held on the same course as the US Open Wildwater race last year. The race started at Ferebee Park and ended just below the Ledges rapid. The real competition at the US Open Wildwater race was in the Junior classes with a great deal of discussion as to who would be fastest, the junior men or women. Emily Stein put in another great performance but could not edge out Chan Jones, an up and coming mens junior kayaker. Special thanks to the volunteers for providing assistance with starting and timing. We had a great day of racing with PRs (personal records) set by many of the competitors.